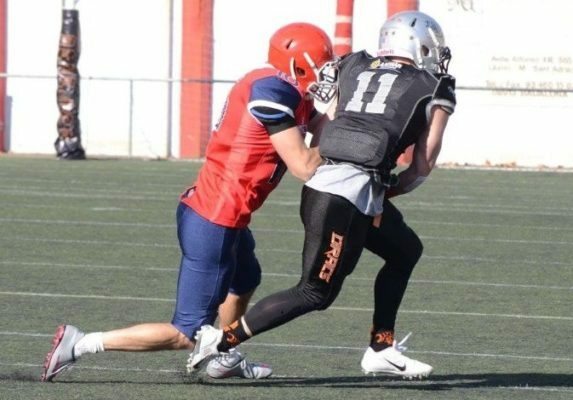 The Badalona Dracs, runaway leaders of Spain’s top American football league so far this season, and the defending champion Valencia Firebats, are in a two-team race for the Spanish title. Both teams handled their opponents on the weekend fairly easily as the Dracs blanked the last place Valencia Giants 48-0 while the Firebats disposed of the third place Barbera Rookies 26-8. It looks as if these two are headed for their third straight Spanish title fight. In the first game of the season between these two teams, the Rookies threw a scare into Valencia and it took a last second touchdown for the Firebats to win the game. This time, Firebats head coach Alvaro Quetta had his team prepared. Quarterback Thomas Murphy threw three touchdown passes and Javier Martinez caught two of them as the Firebats scored all their touchdowns before the Rookies could get on the board. Murphy found Muhamed Najim to open the scoring early in the first quarter. The Rookies moved into touchdown range later in the quarter but quarterback Michael van Deripe was picked off to snuff out the drive. Nursing a 6-0 halftime lead, the Firebats imposed their will in the second half as Murphy tossed a touchdown pass to Martinez to extend the lead to 13-0. Then in the fourth, the Firebat’s ground game kicked into gear as running back Hector Pertegaz scored making it 19-0. Martinez grabbed his second touchdown pass of the day and the Firebats held a 26-0 lead with three minutes left. That’s when van Deripe hit Alex Crespo for the Rookies only major and Tim Pape added the two-point conversion to round out the scoring. Receiver Robbie Jackson was too much for the Valencia Giants secondary to handle as he caught three touchdown passes from quarterback Mike Box while Drew Clausen scored two as well in the Dracs 48-0 romp over the Giants. Running back Javi Fernández opened the scoring for the Dracs in the first quarter on a pass from Box. That’s when Jackson went to work as he became a one-man wrecking crew scoring all three of his touchdowns before the break giving Badalona a 28-0 halftime lead. The onslaught continued in the second half as Clausen added his two scores while Sergi Gonzalo finished the scoring off. Dracs head coach Oscar Calatayud now has two weeks to prepare for the final regular season showdown with the Firebats.